A backyard entertainment area can be one of the most rewarding ways to improve your lifestyle. But, it can be a daunting task to put together a plan that incorporates all the ideas you have in mind. We are here to help with the decision making process. To help you start this journey we have some questions you may ask yourself to help decide what pool is right for your needs. Whether you are looking to sunbath with friends, swim for fitness, float on an air mattress, play volleyball or just lounge and watch the family play and enjoy, we can help you find the right pool to suit your needs. With so many different pool designs and features we can find something for anyone. Are you looking for tanning ledges or water features. Possibly a sport pool to play volleyball and basketball. Perhaps you would like massage jets, decorative lights or a year round spa. We can help you find the features that will make your pool the backyard experience of your dreams. Installing a pool can seem like an overwhelming experience however we are here to guide you through the process so you can enjoy your investment for years to come. With Aqua Blue Designs Inc. we have the knowledge and ability to have your backyard oasis come to life. We can help you layout your designs and provide sketches of your project. We will obtain the permits necessary to install the pool. 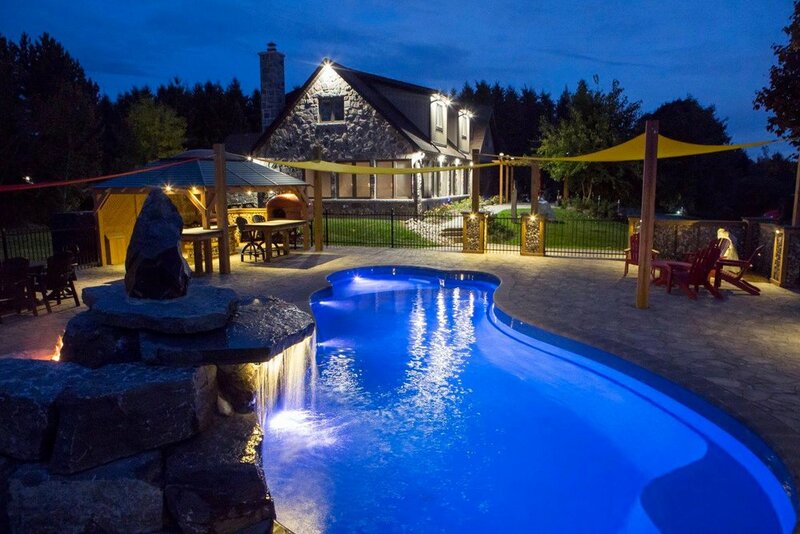 Finally, when it comes to the construction and installation of your pool you will have a team of professionals with the goal of providing you and your family with an amazing back yard swimming oasis.